The eyes are the only place in the body where blood vessels may be seen without surgery. Every test conducted at Dr. Glasser’s office is performed using state-of-the-art equipment and up-to-date diagnostic technologies combined with his over 30 years of experience in eye care. The reason why we ask about your full medical history is because your answers help us pin-point other health issues that may be associated with your eyes. Often times, through a series of eye tests, Dr. Glasser can inform patients, who may have never presented a symptom before, of medical conditions that require attention. As part of his standard tests, Dr. Glasser examines the visual system of the eye for signs of nearsightedness, farsightedness, astigmatism, near vision, and the overall eye health. 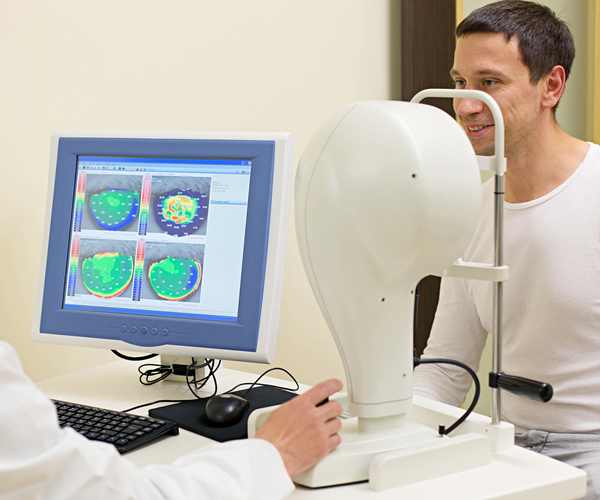 Thanks to the Optimap Retinal Exam, dilating your eyes is no longer normally necessary to evaluate the back of the eye and all its structures, including the optic nerve, the retina, and the blood supply. This important test will help determine a person’s tendency towards glaucoma, high blood pressure, diabetes, macular degeneration, and retinal problems among other forms of health threatening conditions. Do you need an eye and vision test? Contact us to learn more about the practice. I was tired of using contact lenses and glasses, but I didn’t want to have LASIK surgery. Dr. Glasser suggested Corneal Refractive Therapy. After just 2 visits, I was seeing 20/20 with no glasses or contacts! Now, I can see and not worry about losing my glasses or contacts when I swim or play sports. I’m only sorry I didn’t do this sooner.